EarthTalk: Biomass Energy - Hype or Solution? EarthTalk: Biomass Energy – Hype or Solution? Biomass is plant matter that is burned as a source of energy. Fallen or cut wood that is burned for heat is one primary form of biomass, but another includes plant or animal matter that is converted into biofuels. According to the International Energy Agency (IEA), which was formed during the oil shocks of the early 1970s to help ward off future energy shortages, biomass combustion is a carbon-neutral process because the carbon dioxide released at burning has previously been absorbed by the plants from the atmosphere. Biomass resources, reports IEA, include agricultural residues, animal manure, wood wastes, food and paper industry residues, municipal green wastes, sewage sludge, and a large variety of grasses and crops. But while biomass may in theory be carbon-neutral, green groups point out that there is no free lunch. The Natural Resources Defense Council (NRDC), for example, points out that some American timber companies are targeting whole trees from forests as an easy source of biomass and are pressuring Congress to open up additional National Forest acreage for this form of energy generation. NRDC says that, practically speaking, burning whole trees for biomass energy is far from carbon-neutral, given that the carbon dioxide that trees accumulate over decades is suddenly released into the atmosphere upon combustion, just like when coal is burned. “But unlike coal, however, trees will continue to absorb carbon if left alone.” Therefore, the burning of forests for biomass energy both emits considerable amounts of carbon and destroys an important way carbon is prevented from entering our atmosphere. Deforestation isn’t the only problem with biomass. Burning biomass also produces sulfur dioxide, nitrogen oxides, particulate matter and other toxins harmful to our health. Two California wood-fired power plants were fined $830,000 under the Clean Air Act recently for violating emissions standards. Biomass can be a part of the effort to cut back on fossil fuels, but only if it is harvested and used in ways that reduce pollution, cut emissions and protect forests. 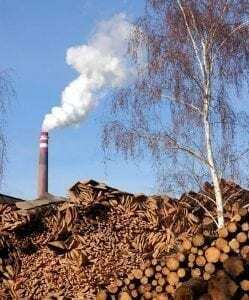 NRDC and other green groups would like to see Congress impose stricter rules to rein in soot, smog and greenhouse gases at biomass power plants and pass measures that safeguard forests from deforestation for biomass development.